The P320 is a modular, poly frame service pistol designed from the ground up with law enforcement officials. 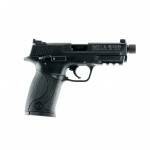 Features a serialized, stainless steel frame, polymer grip module, and a removable fire control assembly. Customizable to any hand size or duty requirement with optional components. Does not require the operator to pull the trigger or use a special tool to disassemble the firearm for cleaning or maintenance. Quick trigger pull with a pronounced reset. No external safety or decocking lever..
Everything about the P320 X-Series is designed to give a fantastic shooting experience. Now, it's available in Carry size. 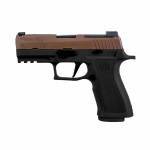 The P320 X-Series features a modular polymer X-series grip that adds speed and flexibility to everyday carry capabilities. It also features an extended beavertail and high undercut trigger guard to promote a higher grip and improved recoil control. Enhanced slide serrations and lightening cuts keep the slide weight light and manageable. This striker-fired pistol comes equipp.. 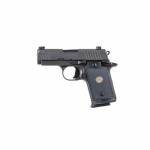 The most compact 9mm in the Sig Sauer product line, the P938 offers the advantage of the 9mm cartridge in a platform similar in size to the P238 pistol. The single action only trigger coupled with full-size Siglite Night Sights makes the P938 handle like a much larger pistol, yet is still easy to carry concealed. An ambidextrous safety makes the P938 easy for left- and right-handed shooters. The P938 packs 6+1 9mm rounds (7+1 in finger rest mags - included) into an all-metal frame. Fans of ..
Sig's Pistols are engineered to perform anywhere, at any time, and under any circumstance. They boast unique, advanced features that stand out among the rest. 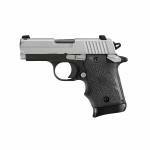 The P938 microcompact is inspired by the P238, but is still easy to conceal and even easier to shoot.The P938 Micro-Compact Legion model features an all-metal frame. The cocked-and-locked single-action trigger gives the P938 unmatched accuracy, while the ambidextrous safety makes it easy for left- and right-handed shooters. 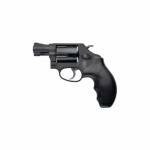 This model has ..
Smith & Wesson J-Frame revolver is designed to fire a full power round and is as simple and easy to use as it is reliable. The Model 642 LS is a variation on the Model 42 Centennial Airweight which integrates the time-tested features of the original with modern advancements. This Lady Smith model has an aluminum alloy frame, stainless steel barrel and cylinder, integral front and fixed rear sights, internal hammer, and a wood grip with finger grooves. 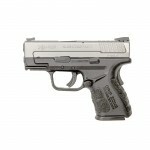 Caliber 38 Special Model 64..
A reduced scale version of the full sized M&P pistol. Reduced scale version of the full-size M&P Pistol 3.56in Barrel Length Threaded barrel - 3/8”x24 takes 3/8”x24 to 1/2”x28 adapter 2 magazines included Ambidextrous manual safety Reversible magazine release Picatinny-style accessory rail Magazine Safety - Will not fire without magazine inserted Internal lock Captured recoil guide rod & spring for easier assembly/disassembly Made in USA .. The Smith & Wesson M&P has a reinforced polymer chassis, superior ergonomics, ambidextrous controls, and proven safety features. In designing the M&P, Smith & Wesson considered the needs of military and law enforcement from every conceivable angle, so the M&P is the standard in reliability when your job is to serve and protect and your life is on the line. 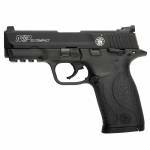 This M&P22 Compact model features a black polymer frame with a Picatinny rail, black Armornite aluminum slide, and 3-dot sights with an adjus.. 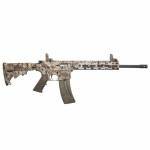 This item comess with a 10" M&P slim handguard, Magpul MBUS folding sights, easy to mount M-LOK accessories, 6-position carbine stock, and a two position recieve mounted safety lever. Action :Semi-Automatic Caliber :22 Long Rifle Barrel Length :16.5" Capacity :25+1 Trigger :Standard OAL :33.75" Weight :5 lbs Stock Description :6-Position Black Metal Finish :Black Barrel Description :Carbon Steel Receiver Material :Polymer Sights :Foldable MBUS Hand :Right Metal Fi.. This item comess with a 10" M&P slim handguard, Magpul MBUS folding sights, easy to mount M-LOK accessories, 6-position carbine stock, and a two position recieve mounted safety lever. Action :Semi-Automatic Caliber :22 Long Rifle Barrel Length :16.5" Capacity :25+1 Trigger :Standard OAL :33.75" Weight :5 lbs Stock Description :6-Position Black Barrel Description :Carbon Steel Receiver Material :Polymer Sights :Foldable MBUS Hand :Right Metal Finish Group :Kryptek/Bl.. 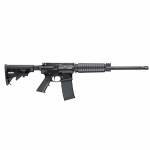 The Smith & Wesson M&P 15 Sport II features a 16" 1-9" twist chrome lined barrel. It has a 6-Position collapsible stock. 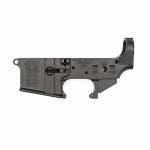 The front sight is an adjustable A2 post sight and collapsible MBUS rear sight. It features a 30+1 capacity, dust cover, and forward assist. Action :Semi-Automatic Caliber :223 Remington/5.56 NATO Barrel Length :16.0" Capacity :30+1 Trigger :Two Stage Safety :Star OAL ..
M&P15 Rifles are the ideal modern sporting rifle. Built to perform multiple uses under various conditions, M&P15 Rifles are as versatile as they are reliable. Engineered for a wide variety of recreational, sport shooting and professional applications, M&P15 Rifles are easy to accessorize, but hard to put down. M&P15 Rifles are lightweight and rugged embodying the best combination of function and form. 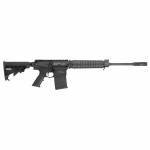 Action :Semi-Automatic Caliber :223 Remington/5.56 NATO B..
M&P15 Rifles are the ideal modern sporting rifle. Built to perform multiple uses under various conditions, M&P15 Rifles are as versatile as they are reliable. Engineered for a wide variety of recreational, sport shooting and professional applications, M&P15 Rifles are easy to accessorize, but hard to put down. 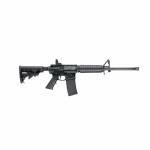 M&P15 Rifles are lightweight and rugged embodying the best combination of function and form. Features • Gas Block with Integral Picatinny-Style Rail • QD Sling Swivel Attachment Po..
Smith & Wesson M&P10 308 WIN / 7.62x51 18in Barrel 20+1. The world's first .308 that comes in M&P and easily makes short work of long range. Chrome-lined gas key and bolt carrier. Ambidextrous magazine catch, bolt catch and reversible safety selector. Patented S&W enhanced safety selector. Gas block with integral Picatinny-style Rail. QD sling swivel attachment point at bottom of gas block. 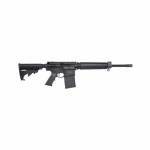 Caliber :.308 WIN / 7.62x51 Barrel Length :18" OAL :37.6" collapsed / 40.9" extended Capacity..
M&P10 Rifles are versatile, easily accessorized, and suitable for a wide variety of recreational, sport shooting and professional applications. Engineered with 5R Rifling and 1/10 Twist, the M&P10 is as accurate as it is powerful. Making short work of long range, M&P10 Rifles keep you at the ready. Caliber :.308 WIN / 7.62x51 Barrel Length :16" OAL :34" collapsed Capacity :20+1 Weight :8 lbs Barrel Twist: 1:10, 5R Rifling Trigger Pull: 6.15lbs Grip: Synthetic Stock Descri..
Model 437 .38 S&W Special +P 1.875 Inch Barrel Matte Black Finish Fixed Front Sight Combat Grip 5 Round - Exclusive Single/Double action with aluminum alloy Chiefs Special Style frame and external hammer. Fixed front sight; integral rear sight. Carbon steel cylinder. Synthetic Combat grips. +P rated. Matte black finish. Weighs 15 ounces. AcuSport Exclusive! Barrel Length: 1.875 Caliber: .38 Spl. Capacity: 5 Finish: Matte Black Action :Single/Double Caliber .. 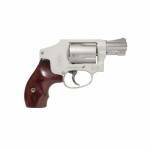 The Smith & Wesson J-Frame is one of the most popular personal defense revolvers on the market. 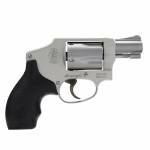 Action :Double Caliber :38 Special Barrel Length :1.87" Capacity :5 Hammer Style :Enclosed Grips :Synthetic Sights :Integral Front, Fixed Rear Weight :15 oz Frame Description :Silver Frame Size :Small Cylinder Finish :Stainless Barrel Finish :Stainless OAL .. The PHU rifles are the result of our collaboration with Pipe Hitters Union attitude apparel. PHU was founded in Baghdad in 2004 by American security contractors who found themselves at war without the benefit of formal weapon supply. This forced them to build their own rifles with little bureaucracy and oversight. This created an era of innovation and an evolutionary jump in development of AR products. This rifle has been built to the specifications of the Pipe Hitters Union CEO, who spent over .. The latest evolution of the polymer pistol. Feel the difference with the GripZone, Ergonomic science is applied to every surface that touches your hand. The GripZone is a set of frame features that work together to give you the best interaction between you and your pistol. Three different textures, each engineered for contact with various parts of your hand for ultimate grip. A re-contoured, slimmer frame and slide has nearly twice the capacity of a single stack, but is only 2 tenths of an inch ..